Spring is almost here. It’s one of my most favorite times of the year. I love the new green and spring flowers that start peaking out with the promise of a great summer to come. Easter harps to spring. 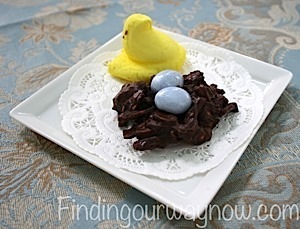 With Easter just around the corner, I thought it would be fun to include this recipe on Grandmother Diaries. 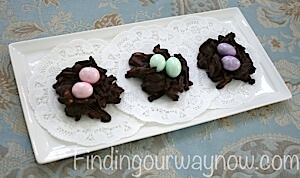 These candy bird nests are just so cute, and really fun to make. Melt chocolate in the microwave in a large measuring cup. Mix shoestring potatoes and peanuts together. Pour the melted chocolate over the nut & potato mixture and combine. Drop a tablespoonful of the mixture onto wax paper. Let cool until hard. These will set up very quickly if refrigerated for about 10 minutes. Store in an airtight container. Notes: You can substitute butterscotch, peanut butter, white chocolate or milk chocolate chips in place of the semi-sweet chocolate. Place two to three small malted milk ball eggs (depending on the size) in the center of each candy while still warm. Press lightly to ensure the candy eggs stick or if needed, use a little melted chocolate as glue. Place in the refrigerator for about 10 minutes to set. To serve, place the Peep on the side of each nest. Using different variations of chips and decorations, this recipe is good for any time of year. I do different things with it to make it fit what ever holiday happens to be at hand. If you make this recipe, send me a picture and share your experience. Enjoy! These are beautiful. And, so simple!